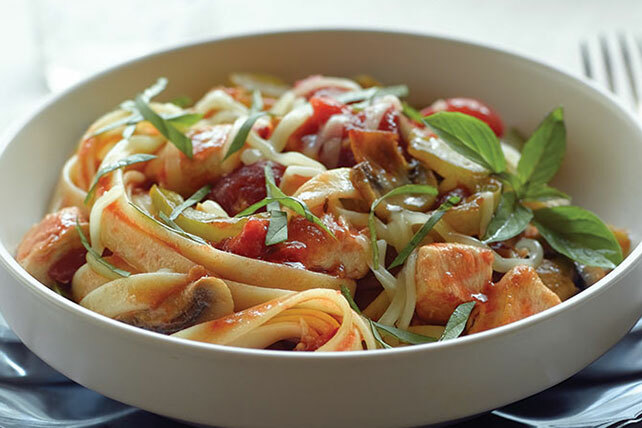 A traditional Italian dish is transformed with our Quick Fettuccine Cacciatore recipe. Quick Fettuccine Cacciatore is a smart choice for the whole family. Meanwhile, heat oil in large skillet on medium-high heat. Add chicken; cook and stir 5 to 6 min. or until no longer pink. Add peppers and mushrooms; cook 3 min., stirring occasionally. Stir in tomatoes and dressing; simmer on medium-low heat 5 min. or until chicken is done. Drain pasta. Toss with chicken mixture; top with cheese and basil. Add 1 cup pitted black olives with the tomatoes. Prepare using 4 cups of your favorite shaped pasta.